There are so many wonderful birds and bird habitats in Nebraska that a single lifetime isn't nearly long enough to enjoy them all. 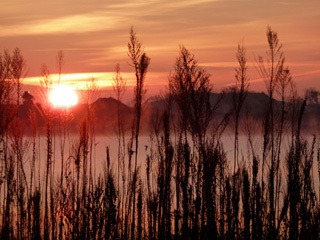 Nebraska’s Platte Valley annually hosts the world's largest crane concentration, and also is the most frequent stopover-point for migrating Whooping Cranes. Our Sandhills region of grassy dunes and wetlands hosts many endemic prairie birds, including both Greater Prairie-Chickens and Sharp-tailed Grouse. 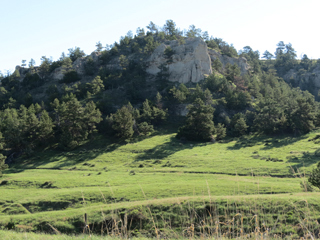 Our western Pine Ridge country is a miniature Rocky Mountain ecosystem, with many western songbirds and raptors. The Missouri Valley forests ring each spring and summer with the voices of eastern warblers, tanagers, and flycatchers. Like two clear blue ribbons, the Niobrara and Platte rivers connect both ends of the state and provide the meeting grounds for several species of eastern and western birds. What more could a bird-lover want in a state? Don&apos;t miss the outstanding slideshow of breeding birds! This elusive species migrates annually through the Nebraska grasslands to its breeding prairies to the north. A small prairie gull, thousands migrate through the Central Flyway on their way to and from the potholes to the north. A bird that has been expanding eastward, it is still more likely to be found in the west. A species that has disappeared from many historical breeding areas is still secure in Nebraska. Hundreds of thousands of Snow Geese migrate annually through the Central Flyway. This southwestern kingbird reaches the easternmost part of its breeding range in extreme Western Nebraska. There is a reason the Peterson guides used the 100th meridian, which dissects Nebraska, as the change from eastern to western species. Nebraska has an active birding community involved in regular activities like seasonal surveys as well as regional festivals. Join our Yahoo group to discuss recent sightings, identification questions, and other topics of general interest to Nebraska birders. Not a member of Nebraska Ornithologists' Union?